First, I'd like to say how grateful I am for being selected for Reefkeeping Magazine's Tank of the Month. Reef Central and Reefkeeping Magazine have featured some of the most beautiful tanks in the world and although I don't consider my system to be in the same league as many of them, I do consider it a great honor to be featured among them. Being situated in a small northern Ontario city, I can't overemphasize the importance of sites like Reef Central in providing a tremendous resource for learning about this wonderful hobby. I can certainly attribute a large part of my success directly to the advice and experiences I have mined from the Reef Central forums. My interest in marine aquaria began in 1997 following a protracted fascination with African cichlids that lasted well over ten years. The transition from freshwater to marine came with challenges, as I learned what it took to have a successful reef aquarium. My first marine tank was a 130 gallon mixed reef dominated by LPS, soft corals and a large fish population. An undergravel filter supplemented with a canister, biowheel, fluidized bed and carbon tube filtration systems proved effective in the short term but eventually resulted in unmanageable nitrate levels. Overcrowding-induced stress caused frequent outbreaks of Ich among the fishes. I treated this temporarily using UV sterilization and potions marketed for their magical abilities to cure various ailments. Unfortunately, it was only through trial and error and thousands of dollars invested in equipment, much of which currently resides in storage containers, that I acquired the basic skills required to keep a successful reef ecosystem. In the spring of 2001, plans were underway for an upgrade to a larger, 280 gallon system. Space-wise, I was limited to the same 72" of tank length as the previous setup but had the luxury of expanding to 30" of both width and depth. My interests had shifted, as occurs with most hobbyists, from common LPS and softies to more light and/or flow-demanding SPS corals and clams. My new system would require some significant design changes and although the final tank layout still has a number of inherent deficiencies, it has proven effective for the successful husbandry of the animals I currently keep. In this article, I will highlight some of the main elements of my setup. As we all know, there are many ways to do things in this hobby. I hope that by sharing my experiences, I can help others as they strive for success. I welcome comments and hope this review fosters discussion. The transition to the new system was complicated by the fact that the tank would reside in the same location as the old one. That meant I would have to tear down the old setup and house the live rock and corals I planned to keep in temporary holding tanks during the transition period. In September 2001, I dismantled the old tank and began construction of the new system. The complete new system was installed and cycled by mid-December. I purchased my tank from Inter-American Pet Supply in Calgary, Alberta and was very pleased with the quality of their workmanship. The tank is eurobraced and has two back corner overflows, each containing a 2" Durso standpipe drain and 3/4" return. The tank weighs 800 pounds empty and if it weren't for hired piano movers, it would have been a real challenge to get it into position in my family room. The tank has 5/8" thick LOF glass walls, a 3/4" thick glass bottom, is laminated with an Indicoat mirror backing, and contains greylite glass overflows, black silicone seals and ground and polished corners. The tank sits on a custom-built Aquaview Industries stand manufactured in Toronto. A two-inch tubular steel frame sits inside the stand to provide the necessary strength to carry the tank's two-ton load. A 12" high matching canopy built by the same company houses the lighting system. A 70 gallon sump, subdivided into three main compartments and containing a series of baffles to prevent bubbles from returning into the show tank, sits under the tank in the stand. Two 3/4" bulkheads plumbed to Gen-X Mak 4 return pumps in the adjacent room push tank water back to the tank through 3/4" Loc-Line spouts split to two 1/2" flared nozzles. Two Maxijet 1200 pumps provide additional flow along the back wall of the tank. The sump holds a My Reef® Creations protein skimmer and receives effluent from the Precision Marine calcium reactor and Reef Solutions kalkwasser reactor. A Tunze Turbelle stream TS/24 kit provides the majority of the system's flow. I have placed the two powerheads at opposite ends of the tank, pointing at each other and set to pulse between 65 and 100% flow at a five second interval. Since adding the streams, I have noticed a marked improvement in both coral health and growth rate. Polyp extension is significantly better and detritus build up on the live rock is significantly less. For 6.5 of the 7 years I have been in the marine hobby, I have lit my tanks with VHO fluorescent bulbs. It wasn't until December of 2003 that I switched to a metal halide/VHO combination. I currently light this tank with a do-it-yourself setup comprising three 400 watt Radiums fired by Son Agro 430 watt high-pressure sodium ballasts and two 60" URI VHO fluorescent actinic bulbs driven by an IceCap 660 ballast. I am also running a 48" T5 fluorescent actinic bulb driven by a Workhorse 7 ballast. I transitioned from VHO to this combination over a ten-week period by slowly increasing the metal halide's photoperiod by an hour per week and simultaneously reducing the VHO cycle by the same amount. The immediate response to this lighting change was the bleaching of most of the coralline algae in the well-lit areas. A decrease in ORP from 425 mV to 350 mV also corresponded with the change. I assume this signaled a dramatic die-off of various life forms not adapted to intense light environs. The ORP of the tank has slowly climbed back to the range of 400-425 mV. Coralline algae growth has resumed, albeit at a much reduced rate, and thrives only in caves, overhangs and lower levels of the tank. Heat was a real concern I had with the transition. Four IceCap fans, mounted inside the canopy, help to disperse heat and cool the stainless steel reflector. A 1/2 hp Pacific Coast chiller plumbed inline with the sump generally runs during the metal halide photoperiod and easily handles the residual heat. The metal halide ballasts sit in a room adjacent to the tank with the chiller, return pumps, dosing pump, kalkwasser reactor and make-up water reservoir, further alleviating any potential sources of additional heat. Details of the lighting system are highlighted below. The water parameters that I regularly monitor include temperature and ORP, and only occasionally specific gravity, calcium and alkalinity. I have learned to read my tank's water quality by the behavior of its occupants. I used to sweat pH to no end but now feel that daily swings between 7.9 and 8.2 don't adversely affects the tank's inhabitants. On many occasions, the presence of a dozen or more people in my family room has caused a huge spike in CO2 and an associated drop in pH of 0.2-0.3 pH units over a 3-4 hour period. In all cases, the tank responded as if nothing were amiss. My occupation as a geologist takes me away from home on many occasions throughout the year. My sojourns often last two to three weeks, especially during the summer. I had to keep this “small" point in mind when designing my system. I don't think I would be too popular with my wife if she had to top off, dose, feed, perform water changes, etc. on a regular basis. For this reason, I have automated as many tank functions as possible. Top-off is performed by a ReefFiller dosing pump. Calcium and alkalinity are maintained by a Precision Marine calcium reactor and Reef Solutions kalkwasser reactor. Water quality is maintained with a My Reef Creations® MR-3 protein skimmer, which is pretty much set and forget if the sump's water level is kept constant. That leaves a quick check of a few vital parameters, and feeding, as the only daily tasks. Below is a list of the regular maintenance items I perform on the tank. My tank contains several hundred pounds of Fiji, Great Barrier Reef, Tonga branch and Tonga plate live rock, some of which I have had since 1997. A large portion of the rock has been permanently fused together by some of my encrusting corals such as Porites sp. and Leptoseris spp., which have spread from one rock to another. When I was setting up this tank, deep sand beds were just becoming popular. I opted for a more traditional shallow sand bed (1-2 inches) composed of CaribSea “select grade" aragonite. I prefer the look of a shallow sand bed, and believe I can achieve effective denitrification with a large amount of dense, chunky live rock. A sand-sifting starfish and several sea cucumbers keep the sand bed stirred. My fish population has stood at 11 for the last year or so. Before that, I had a number of others including a Sunburst anthias, Yellow-headed jawfish and Swissguard basslet whose disappearance from the tank remains a mystery. My Six-line wrasse and Potters wrasse both have an affinity for the overflows, and have jumped into (and back out of) them on several occasions. I hesitate to add more fish now because the current group gets along so well. I would love to have a small school of Bartlett's or Purple Queen anthias in my tank, but I think their demanding dietary requirements would negatively impact my system. I used to believe in a heavy feeding regimen but have now reversed that trend and feed sparingly. I now feed either once every day or every other day. 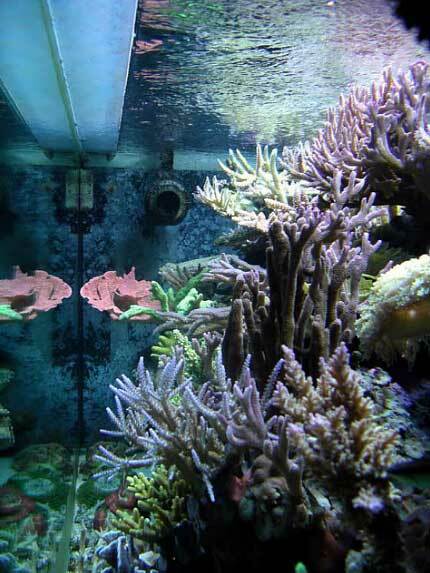 The tank is so heavily stocked with corals that it is very sensitive to excessive nutrients. I have lived through horrendous cyanobacteria, dinoflagellate and hair algae blooms in my previous tank and will do everything possible to prevent them in this system. Despite limited feeding, the Powder Blue Tang continues to look fat and healthy. Being one of my more sensitive fish, I figure he would be the first to show signs of malnutrition. His constant grazing on the rocks is undoubtedly providing him with more than enough natural food. None of the corals is target fed. Weekly additions of either DT's Phytoplankton, Golden Pearls or Cyclop-Eeze, in addition to the flake and meaty foods (including their juices) listed below, provide adequate food for the tank's corals. I'm sure many reef enthusiasts know what I mean when I say this hobby is all-consuming and offers tremendous rewards. It has given me great pleasure to share my system with the reefkeeping community. I thank the staff of Reefkeeping Magazine and Reef Central for allowing me to do so and look forward to seeing future Tanks of the Month featured on this wonderful site.